You probably already know that the Toronto ComiCon is an awesome place to meet your favourite comic book creator and get an autograph. You also probably know that the Toronto ComiCon is a fantastic place to go shopping for geeky goodies. And you probably already know that it’s a great place to meet some of your favourite sci-fi and fantasy film and TV stars live and in person. 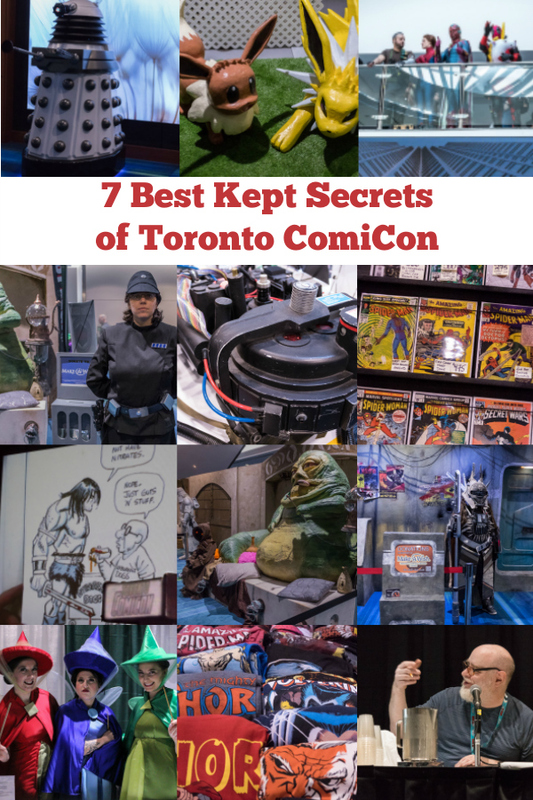 But did you know these seven best kept secrets of the Toronto ComiCon? Disclosure: I received a complimentary press pass to Toronto ComiCon 2019. As always, my words and opinions are my own. 1. The best kept secret of the Toronto ComiCon is the sketch panels. I wrote a guest post over on Geek Life about how the sketch panels are a true hidden gem. They, somehow, and I can’t fathom why, seem to be overlooked by many. The sketch duels are fantastic because everyone in the audience has a chance at winning a piece of original art. It is also an opportunity to watch your heroes at work. The panels are super casual, funny and fun — like an ask me anything for artists. They are also family friendy. There were plenty of kids in the audience at the panels I attended. I would say these events are probably best for older kids, who won’t be bored silly by sitting in one place listening to folks chat for sixty minutes. My 6th grader would love it, while her younger sister would be bouncing off the walls and begging to move on. 2. 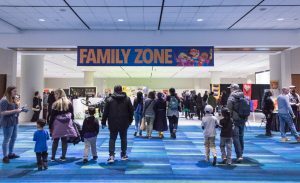 The best kept secret of the Toronto ComiCon is the Family Zone. That’s where they keep the Pokemon, and the board games, plus lots of fun activities for kids and copious seating. Okay, so first I would say, even if you are enjoying the ComiCon sans kids, you should duck into the Family Zone and check it out. Last year I skipped over it. This time I made a point of checking it out and was impressed. 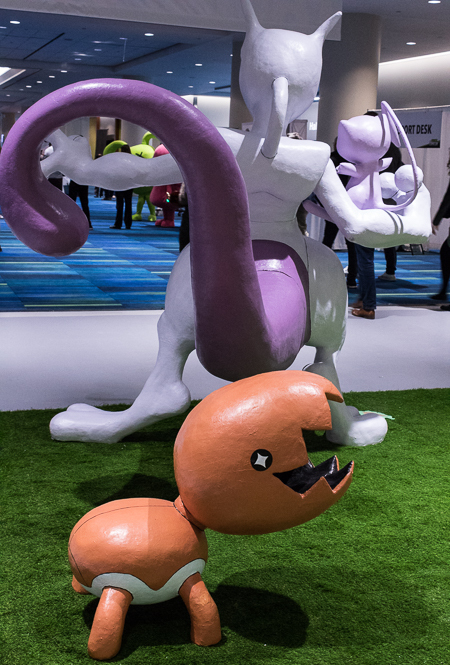 For one thing, there was a collection of giant life-sized Pokemon sculpture in the Family Zone this year, which made for some pretty cool photo ops. These amazing life-sized sculptures were created by local Toronto artist Cat Ward. I asked Cat how she makes these sculptures. Her reply was something along the lines of, “Foam core, paper mache, sand it down, paint it, sand it down, paint it, sand it down paint it and repeat…. and repeat… and repeat.”, laughing as her sentence trailed off into infinty. Secondly, if you are travelling with kids, the Family Zone is a no-brainer. They had an amazing line-up of fun stuff going on over the entire weekend. 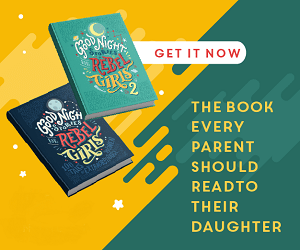 Stuff like a Sorting Hat Ceremony, a Build Your Own Lightsaber class, learning to code with Scratch, Foam Weapon Battles, Pirate School, Princess Story Time and more. 3. One of the best kept secrets of the comic con are the passports. Grab a passport, get it filled out (by visiting eight spots around the con and collecting stamps) and drop it off to be entered to win some cool goodies. The passports are billed as part of the Family Zone, but I saw plenty of lone adults carting these around to get them stamped. 4. One of the best kept secrets of the Toronto ComiCon is the cosplay. I mean you probably already know that there’s going to be folks running aorund in costumes — but did you know just how prevelant it is? I think at least 70% of the people in attendance were in some level of cosplay. And another 29% were in cool geeky tshirts. I actually felt weird being dressed “normal”. Another thing about the cosplay is — for the most part folks are so happy to show off their costumes and interact with people. I witnessed some ridiculously adorable interactions with kids and random costumed heroes. 5. One of the best kept secrets of the Toronto Comicon is that it is a fantastic spot to support chairty. Want to make a donation to the Make a Wish Foundation or to the Sick Kids Foundation? or how about to Visions of Science (a Toronto local non-profit that provides STEM activities for kids)? 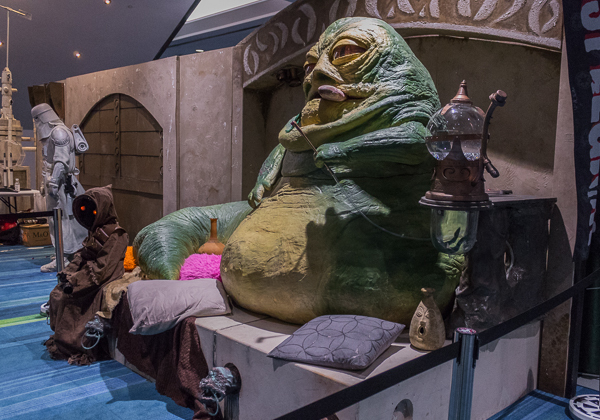 The 501st Legion Canadian Garrison (the local chapter of a worldwide Star Wars rebel and imperium reenactment group) had a very cool set up where a donation to the Make a Wish foundation would get you a photo in front of one of several awesome backdrops, like this giant life-sized paper mache Jabba the Hutt. 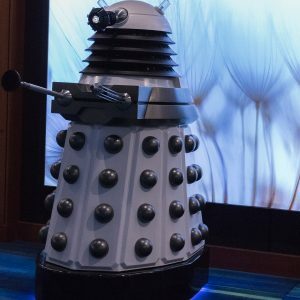 In exchange for donations to Sick Kids the Canadian Dalek Empire were offering photos with a certain iconic time hopping blue phone booth, as well as several amazing “fully functioning” life-sized Daleks. And The Ontario Ghostbusters were offering photo shots with iconic jumpsuits and proton packs in exchange for donations towards Visions of Science. 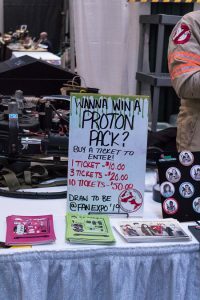 They also were hosting a raffle where you could win your own proton pack, again with the proceeds heading to Visions of Science. 6. One of the best kept secrets of Comic Con is the exclusive merchandise. They have all sorts of fun stuff, like this cool 25th anniversary Harley Quinn figure that I picked up for a friend (fair warning stuff does sell out, so if you’re interesting in one of the con exclusives grab it early). 7. One of the best kept secrets of Toronto ComiCon is that you can buy tickets in advance online and then pick them up at the box office. The line up of people waiting to get in first thing on Friday evening when the Comic Con opened up at 4pm was RIDICULOUS. It was an unending streaming sea of people, heading down the escalator, through the doors into the ticket room. There were volunteers directing traffic, repeating “If you are buying tickets go to the left. If you are picking up tickets go to the right,” in an unending chant. It was an insane line up either way but the pick up line did seem to be moving much quicker. I had a press pass this year, so I was lucky enough to just wiz off to the Press Box and grab my media pass. However my friend Aeryn had to line up to buy a ticket and it took her over an hour. Eeep. I happened to be travelling solo this time around, but I can vividly imagine what lining up for an hour with my kids would be like. No. Thank. You. Unless attending is some crazy last minute decision, I would HIGHly recommend preordering your tickets in advance via the Toronto ComiCon website. Another thing to note is that they offer a family pass, which is good for two adults and up to four kids. Or if you are solo parenting, have very young kids (free for ages 5 and under) or only have one or two kids in tow, it may work out cheaper to get a seperate adult pass(es) plus child or youth pass(es). It pays to double check and do the math. In past years they have also offered a “kids go free” coupon (valid only Friday and Sunday). So that’s something to keep a look out for as well. 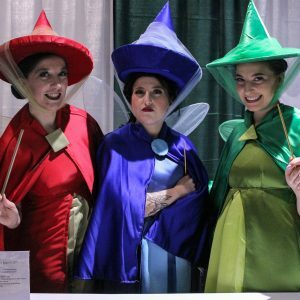 Overall, the Toronto ComiCon is a weekend long oasis of super geeky fun. If you haven’t been, I highly recommend it. If you have been, what was your favourite part? Did I miss anything on my list? 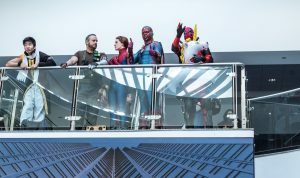 You got a pic of Deadpool with his Unicorn floaty!! *hearts eyes* I was lamenting hard on not being able to get my phone out in time, since we were going down the escalator right then, lol. By the time I’d have been able to capture the pic, the angle was highly unfortunate. And yes, because of March Break, Friday was INSANE. If I go again on Friday next year, I will be buying my ticket online ahead of time. That photo was SO washed out. It was a quick snap, as you mentioned, while we were heading down the escalator and my camera wasn’t set for the lighting. Thank goodness for Adobe Lightroom. I was so happy it somehow magically turned out after photo editing. And it is, by far, my fav photo from the two year’s that I’ve gone to ComiCon. Wolverine and Spidey, having a heart to heart up there, it’s all just too perfect. One of these times I will bring my kids to Toronto for ComiCon. Probably. Maybe. (On the one hand I know they would love it, on the other I really kind of like that whole laid back birthday trip wih hubby thing that we’ve done the past few years).